Director – Anthony C. Ferrante, Screenplay – Thunder Levin, Producer – David Michael Latt, Photography – Laura Beth Love, Music – Christopher Cano & Chris Ridenhour, Visual Effects Supervisors – Glenn Campbell & Joseph J. Lawson, Production Design – Kalise Wallace. Production Company – The Asylum. 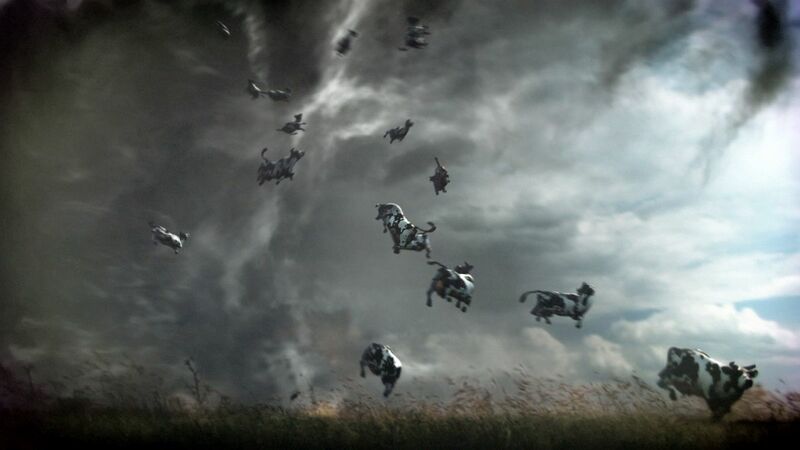 It has been five years since the last sharknado struck the US thanks to billionaire Aston Reynolds who has invented the Astro X system that prevents sharknados from forming. Fin Shepard, still mourning the death of April, is in Las Vegas for the wedding of his son Matt when a new sharknado strikes, this time made up of sand. As Fin successfully fights it off, other sharknados start emerging across the country made up of different things such as oil, fire, electricity and radiation. As Fin races across the country to find a way to stop these, what he does not realise is that April is alive, having been rebuilt in a cyborg body by her eccentric scientist father. Sharknado: The 4th Awakens is the fourth of the films that began with the surprise hit of Sharknado (2013). Sharknado was just another of the deliberately ridiculous monster movies regularly made by the low-budget production company The Asylum but it took off in surprising ways after being acclaimed a cult bad movie hit. The Asylum, ever the company to exploit a phenomenon, then served up Sharknado 2: The Second One (2014) and Sharknado 3: Oh Hell No! (2015), each at annual intervals. Sharknado: The 4th Awakens, although listed as Sharknado Episode IV: The Fourth Awakens according to the mock Star Wars-styled opening credits crawl, was the third of the sequels. Sharknado 3 reached a peak for the series where the sense of tongue-in-cheek absurdity got everything just right with absurdly entertaining results. In the same way that Sharknado 2, coming after the first film, seemed to be searching for what struck a nerve with audiences the first time around, The 4th Awakens seems to looking around and trying to see where it can go next after Sharknado 3 where you had sharknados threatening the entire US continent and sharks travelling up into orbit and being fought aboard the space shuttle. The answer would appear to be not much. This starts with a ‘five years after’ and then tries to mix the basics up by giving us a new series of sharknados made of electricity, fire, sand and radiation, even a ‘cownado’, which seems less like creativity than dredging the barrel for something new to do. Coming up with increasingly more ridiculous things for sharks to do were a big part of the previous Sharknado films but the ones here are surprisingly lacklustre. The opening Las Vegas sequence has Ian Ziering driving a luxury car down a ramp circling the exterior of a building (where the effects are so shoddy it looks like he is driving around a brightly coloured party streamer) before setting sail aboard the pirate ship from the Treasure Island Casino. None of this seems particularly absurdly funny in the same way that Sharknado 3‘s White House opening was – the most amusing scene is seeing a Chippendale dancer crotch punching a shark away. Other scenes seem to be trying to subvert the previous films, like the climax that has the various cast being swallowed up in sharks, each of which is then devoured by a larger shark whereupon the cast have to be progressively cut out of a series of stomachs not unlike a Matryoshka doll. It feels more of a case that where the first films were inviting their audiences to enjoy the absurdity, this has simply become silly. The Sharknado series, it would appear (I have to say it), has jumped the shark. More than anything, this feels like a Sharknado film that was put together in a hurry or that corners were drastically cut. 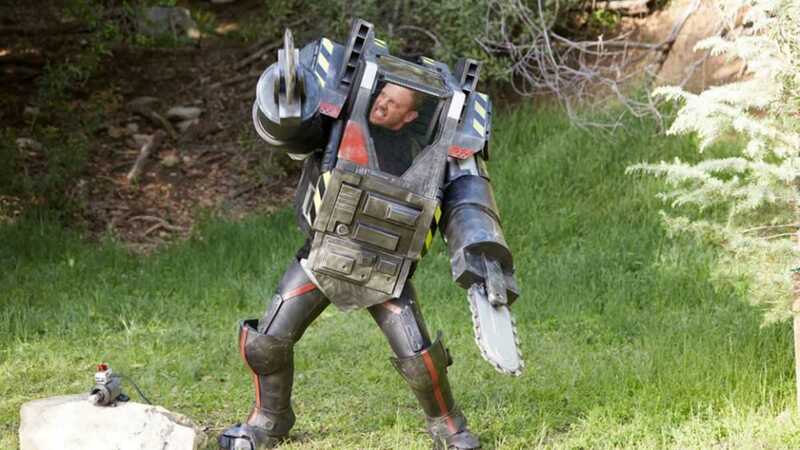 In some cases, the film sets up sequences but only lets them happen off screen – while in Texas, Ian Ziering unveils a Transformer-styled suit with massive-sized chainsaw arms but the actual use of it is never depicted. A rocket backpack suit is introduced for David Hasselhoff to dive into Niagara Falls at the climax but this is blown away before it can be employed. Tara Reid is rebuilt with a cyborg body but there are a mere handful of scenes where we see this in operation and it is never crucial to the plot. The script lacks much in the way of a uniting dramatic drive – it merely has a series of scenes with Ian Ziering and co encountering different sharknados across the country while the fight to use Niagara Falls to stop the one made of radiation abruptly becomes a climax. This film seems to be going for celebrity cameos even more than any of the previous films, including several US news hosts, David Faustino and Susan Anton as casino gamblers, Carrot Top as a Vegas taxi driver, Troma head Lloyd Kaufman as a technician who gets a line “nuke ’em high”, Cheryl Tiegs replacing Bo Derek as Fin’s mother, Dr Drew Pinsky, Duane Chapman aka Dog the Bounty Hunter, various Vegas performers including Wayne Newton, several Chippendale dancers, and probably a lot of other no-name celebrities I didn’t recognise because I don’t obsessively watch junk US television. It is also a film that conducts a number of elaborate set-ups in order to make genre in-jokes – the visit to Texas contains actors such as Caroline Williams and Dan Yeager from the Texas Chainsaw films making a lot of chainsaw-related puns; or an elaborate set-up where Ian Ziering is whirled up into a sharknado inside a farmhouse in order to land on Stacey Dash, leading to a The Wizard of Oz (1939) gag; while Alexandra Paul and Gena Lee Nolin, David Hasselhoff’s compatriots from Baywatch (1989-2001), turn up to join him amid a series of in-jokes. Ian Ziering made an amusing crossover appearance in Lavalantula (2015) prior to this and so that film’s star Steve Guttenberg makes a similar cameo here before giving Ian Ziering a custom car that for some reason is made up to resemble Christine (1983) amid lines about it having a mind of its own. This was followed by Sharknado 5: Global Swarming (2017) and The Last Sharknado: It’s About Time (2018).